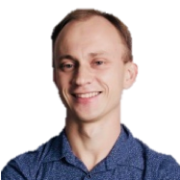 Andrey Tolmachev is an experienced Scrum practitioner, Scrum Trainer and Enterprise Agile Coach helping organizations to leverage benefits of business agility to build valuable products for their customers. With more than 14 years of experience in software product development across several enterprises he has been helping companies to become more adaptive and to strengthen delivery of valuable products. Andrey applies systemic approach for organizational coaching, working thoroughly with development, management and business people to support a sustainable growth of agility inside the organization. His typical work includes coaching Multiple Development Teams, Product Owners, Scrum Masters and Agile Coaches, and working with Leaders. Andrey is a certified professional coach. He employs coaching approach in his work and believes that coaching is a great tool to develop people and help them grow as professionals and individuals. Through this he helps to create a powerful foundation for a strong agile organization.